This access statement does not contain personal opinions as to our suitability for those with access needs, but aims to describe the facilities and services that we offer all our guests and visitors. Access Statement for Inn on the Square, Keswick. We welcome all guests at the Inn on the Square, including guests with an impairment which could include mobility, sight, hearing and learning disabilities. It is recommended that you discuss your requirements with our reservations team at the time of booking to ensure the most suitable room for your requirements is allocated to you. Situated in the heart of the Lake District, this family owned hotel is the perfect place to stay whether you are visiting for business or leisure. The hotel is situated directly off the pedestrianised Market Square on a slight hill with a gradual approach. The front entrance has one small step from the pavement and 3 further steps to negotiate. The rear entrance through the Hotel’s parking garage has level access with one smooth ramp directly to the Hotel’s lift, which has access to all floors. 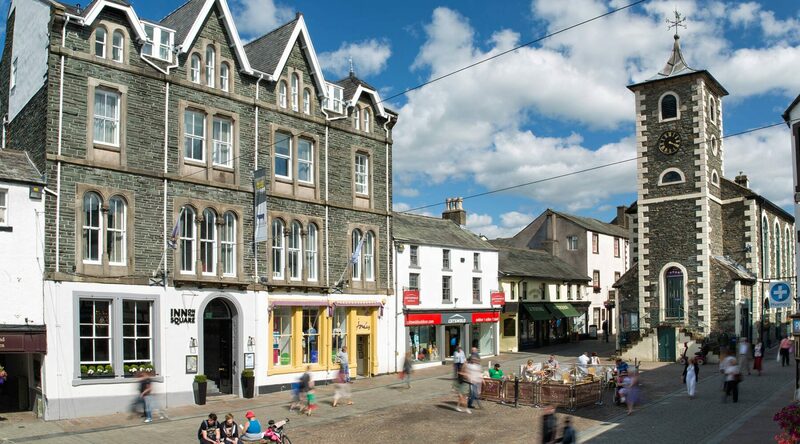 Being in the centre of Keswick we are just minutes away from all the attractions, shops, restaurants and cafes, as well as having many Lakeland walks of all grades which can be completed directly from the Hotel’s front door. We have 34 bedrooms over the hotel’s upper 3 floors, with 2 accessible bedrooms suitable for wheelchair users; both situated on the first floor. Both rooms have step-free direct access via the lift. All bedrooms have en-suite bathrooms, containing a walk-in wet room shower. We look forward to welcoming you to the Inn on the Square. 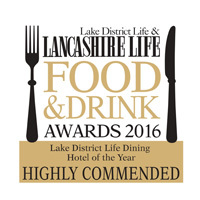 If you have any queries or require any assistance please phone 017687 73333 or email innonthesquare@lakedistricthotels.net. For full details and maps of how to reach us please see the directions section of our website. Alternatively, you can plan your journey by car or public transport using www.transportdirect.info; simply enter your postcode and ours to get directions. Our parking garage post code is CA12 5JL. The nearest railway station is Penrith, which is 17 miles away (a 20 minute taxi ride). Taxis are available at the station. 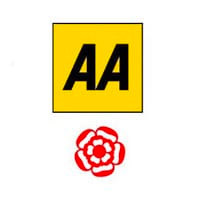 If you require an accessible taxi this can be booked in advance, see contact information for details. The nearest bus stop is at Booth’s Supermarket, a 10 minute walk from the hotel – This is the central bus station for Keswick. There is no shelter and limited seating. The X5 bus runs to/from the bus station and Penrith railway station, the frequency varies between 30 minutes and 60 minutes between departures depending on season and time of day. Please visit www.stagecoachbus.com for up to date timetables. There is limited parking on site, with 7 parking bays in our secure garage, which must be pre-booked. The nearest car park is Bell Close Car Park, directly behind the hotel, but this has a maximum stay of 3 hours. It has a capacity of 121 vehicles with 8 clearly displayed Blue Badge spaces. This is a pay-and-display car park. Access to the hotel from this car park is across level tarmac and to the side entrance up two steps or via the level back entrance through the hotel garage. 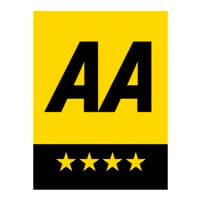 Otley Road Car Park is the closest long-stay car park with 84 spaces. It is less than 5 minutes’ walk from this car park to the Inn on the Square. This is also a pay-and-display car park, however the Inn on the Square has 24-hour parking vouchers available from reception for £2 a night. The car park is well lit at night. There is a drop off point at the main entrance of the hotel, but only accessible to taxis between 5pm and 10am, as this is a pedestrianised area. The main drop off point is at the rear of the hotel, where access is gained through the parking garage. You can leave your car here while you drop your bags off at reception. There are 4 steps leading to the main entrance of Inn on the Square, one small step from the pavement and a further 3 steps which are 5” high, 11.5” deep. The external entrance doors are painted black and are manual, substantial doors which are held open during normal operating hours. The internal entrance doors are glass with manifestation at eye height and are light to pull/push and opens outwards. 24hour assistance is available. If the external doors are closed a lit call button and intercom are available to call assistance. If you arrive to the back of the hotel you will access through the garage. Leave the garage through a swing door which leads into a lobby area. Another swing door, straight ahead, takes you into the courtyard, down a smooth ramp and into the basement of the hotel. A lift can be found in the basement or there is a staircase with 15 steps and handrail leading up to the reception. Reception is on the ground floor of the hotel and has level access throughout. The ground floor surface alternates from carpet, to wood, and tile. The area is evenly and well lit with overhead lighting and wall lights. The reception desk is all single height at 45” high, but open at the right hand side for access. Lounge tables and chairs are available close by should this be required as an alternative space for check-in. A pen and pad of paper are available on request. The lift is available close to the reception which takes guests to all floors of the hotel. The lift is situated within the centre of the hotel and covers basement, ground level, first, second and third floors. Tactile buttons can be used to select which floor you want. There is a mirror on the back of the lift, the sides are covered in metal and the floor is short pile carpet. The lift has a 31” wide entrance door and is 42” deep. The keypad to take you to each floor is on the right as you step into the lift. There is a raised Ground Floor button and braille under the floor number buttons. The stairs from the basement to the reception consist of 15 steps which are approximately 7” high and 9.5” deep with a grab rail provided. The rear entrance through the basement corridor narrows to a width of 28”. There is a fire exit to the side of the courtyard at the rear of the hotel which has 2 steps; the 1st step is 7” high and the 2nd step is 6” high. Please note there are no ground floor bedrooms within the hotel. There are 2 accessible bedrooms suitable for wheelchair users both situated on the first floor. Both rooms have step-free direct access via the lift. All bedrooms have en-suite shower rooms, containing a wet room shower with tiles set into the floor so there are no steps to negotiate. A glass screen divides the shower from the rest of the bathroom. Please note there is a shelf underneath the basin which may cause difficulties for wheelchair users. 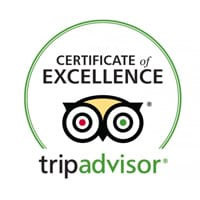 If you have any questions about this please call the hotel on 017687 73333 and speak to one of our management team. All entry doors are 900mm/35.5ins wide, light and easy to open. Furniture can be easily removed or rearranged in the room if requested. Twin or double bedrooms are available. The height of the beds from the floor to the top of the mattress is 450mm/17.7ins. Blocks to raise the height of the bed are available on request. Rooms are bright and evenly lit. Overhead and wall lighting is used, controlled by on/off switch. There are also bedside and table lamps in each room. Additional reading lamps are available on request. These, and all other bedrooms in the hotel, offer the following: All bedroom doors are marked with raised numbers. Lighting as above, good colour contrast between the floor, walls and doors, short pile carpet, all bedding is non-feather, widescreen digital television with remote control, subtitles, and audio description facilities. A vibrating pillow pad is available on request. This Town bedroom on the first floor has an entrance of 35” wide. The doorway to the bathroom is 30” wide and the shower entrance has a level surface and doorway of 29.5” wide past a glass screen. Vertical and horizontal grab rails are in the shower and by the toilet. There is also a seat in the shower. There is 1 emergency pull cord by the toilet. Please note that the tightest gap around the bed is 19”. There is no flashing light in the room in instance of emergencies. Vibrating pillow alarms are available from reception. This Town bedroom on the first floor has an entrance of 32” wide. The doorway to the bathroom is 29” wide and the shower entrance has a level surface and doorway of 26” wide past a glass screen. Vertical and horizontal grab rails are in the shower and by the toilet. There is also a seat in the shower. There is 1 emergency pull cord by the toilet. Please note that the tightest gap around the bed is 32”. There is no flashing light in the room in instance of emergencies. Vibrating pillow alarms are available from reception. Well lit with overhead lights. Good colour contrast between the doors, floor and walls. The flooring is non-slip tile. All other bathrooms have the same lighting, floor fitting and good colour contrast as above. However the shower has a single-step entrance. Fire escape width from Herdwick bedrooms corridor is 26" wide with steps 24.5" wide. From Herdwick 1st floor to ground floor there are 27 steps. From the Herdwick Bedroom 2nd floor to the 1st floor there are 12 steps. Fire escape width from Town bedrooms corridor is 30" wide with steps 24.5" wide. From the roof to 1st floor there are 3 steps, with a further 28 steps to the ground floor. From 2nd floor fire escape to first floor fire escape there are 17 steps. From 3rd floor fire escape to second floor fire escape there are 17 steps. All public areas, halls, stairs, landings and lifts, are well lit using a combination of ceiling and wall lights (fluorescent lighting is used in the lift). Corridors are slightly dimmer lit by wall lights. The main stairs leading up to the bedrooms are 6” high and 11” deep. There are 13 steps from ground floor to the first small landing. There are 5 steps from this landing to the second small landing. 2 steps then take you to the Herdwick Bedroom 1st floor corridor. 7 steps from the second small landing take you to the Town Bedrooms 1st floor corridor. 11 steps to the third small landing, and a further 5 steps to the fourth small landing. 2 steps from the 4th small landing take you to the Herdwick Bedroom 2nd floor corridor. There is 1 step along this corridor which takes you to room 210 and 211. There are 7 steps from the 4th small landing to the Town Bedrooms 2nd floor corridor. There are 11 steps from the 2nd floor corridor to the 5th small landing and 5 steps to the 6th small landing. Finally 3 steps take you from the 6th small landing to the Town Bedrooms 3rd floor corridor. Corridors are 47” wide and the floor covering is short pile carpet. The lift is situated within the centre of the hotel and covers basement, ground level, first, second and third floors. Tactile buttons can be used to select which floor you want. There is a mirror on the back of the lift, the sides are covered in metal and the floor is short pile carpet. The lift has a 31” wide entrance door and is 42” deep. The keypad to take you to each floor is on the right as you step into the lift. There is a raised Ground Floor button and braille under the floor number buttons. The lounge area is situated on the ground floor with level entry from the reception area. There are no doors on the ground floor lounge, reception and bar area. The lounge area has a mixture of seating with sofas and soft chairs with arms, together with a range of tables which can be used for dining at. Lighting is natural daylight, supplemented by ceiling spot lights and floor lamps. By night levels are controlled by dimmer switches, with overhead and wall lighting used as well as floor and table lamps around the room.The flooring is a mixture of short pile carpet and tiles in the lounge and reception lobby, and timber flooring in the bar area. The bar area has a mixture of fixed seating, sofas, soft chairs and upright chairs with high and low tables. Service is offered at the table or at the bar. Bar food and drink can also be served in the lounge, just ask at the bar for menu details. The nearest toilets are in the basement area, which is accessible via one flight of stairs or by descending one floor in the lift. There is a dedicated accessible toilet, situated close to the lift doors. This toilet also contains a baby change table. The restaurant is situated on the ground floor with level entry from the reception lobby area. Double glass doors with manifestation to this area are normally open when the restaurant is open. The restaurant has level access throughout. Tables in the restaurant are well spaced apart, with a clear height from the floor of 24”, with a mixture of upright chairs with and without arms. Lighting is natural daylight, supplemented by a range of spot and ceiling lights, and by night levels are controlled by dimmer switches, with overhead and wall lighting used. Candles are lit on tables. The flooring is short pile carpet, leading to a timber floored area. 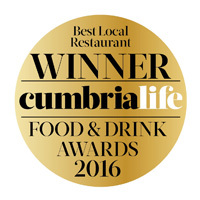 We do our best to cater for any dietary requirements; please contact us in advance with any specific requests. Where possible all our food produce is locally sourced. The restaurant is table service for lunch and dinner. Breakfast is a self-service buffet, with table service for hot food. Staff can assist by running through menus with you. Crockery is colour contrasted with the table where possible. The nearest toilets and accessible toilet are in the basement, which is accessed down stairs in the reception lobby, or by descending one floor in the lift. Level entry into the toilet. 980mm/38.5ins transfer space to the left of the toilet, when facing the toilet. The toilet height is 400mm/15.7ins. There are vertical and horizontal grab rails are available around the toilet. An emergency alarm pull cord next to the toilet. The toilets are well lit with fluorescent overhead lighting activated by a motion sensor. We have a sports bar located behind the Inn on the Square. The Back Bar has large screen TVs showing live sports events, a Pool Table, and Darts Board over two floors. There is no lift to the first floor. 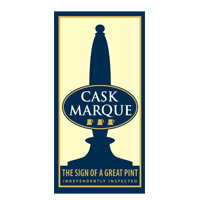 The Bar serves homemade food, locally sourced cask ales, and a range of alcoholic and non-alcoholic beverages. There is a beer garden to the front of the bar with a range of seating and tables. There is no direct access from the hotel to the bar. Access is via the alleyway at the side of the hotel. The alleyway has level access over a mixture of paving and tarmac. There is a single step, 9” high and 29” wide into the bar, level access can be arranged through the emergency exit to the rear of the bar. This door is 29” wide. The staff will be happy to arrange this for you. There are 15 steps up to the first floor of the Back Bar which are 7” high and 11” deep. There is a separate fire escape from the first floor which leads outside into the hotel courtyard down 15 steps which are 7.5” high and 10” deep. Lighting is even throughout. There is natural light from windows; supplemented by both overhead and wall lighting. The flooring is a mixture of stone paving and timber flooring. Chairs and seating is a mixture of fixed banquette seating and comfortable armed chairs and stools. Seating can be arranged to suit. The nearest accessible toilet is on the ground floor at the rear of the bar beside the emergency exit. There are two doors to access the disabled toilet. One is 27” wide and one is 30” wide. There is 1 horizontal grab rail. Please contact hotel reception in advance to discuss any specific services you may require. All of our staff receive regular training that includes disability awareness training. We have a set of evacuation procedures – should you require assistance someone will come to your room and help you with evacuation either out of the building or to a refuge. We have evacuation chairs to assist. A water bowl is available just outside the main entrance for assistance dogs and one is supplied for bedrooms when resident guests bring dogs. Staff are on site 24 hours. Room service is available 24 hours. Clear signage is used throughout the hotel using a sans serif font and large black letters on a contrasting background. The nearest General Hospital with an A&E unit and walk in NHS facility is 2 miles away at the Keswick Cottage Hospital. The nearest doctor’s surgery is 1/2 mile away. Please contact reception for further information. Free Wi-Fi Internet access is available in bedrooms and throughout the hotel. If you require further information which is not covered in this statement or should you have any queries, please let reception know.